Only 6"-8" clearance needed to turn PLAS around pipe. 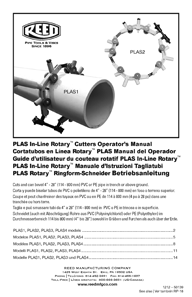 This PLAS In-Line Rotary™ Cutter is excellent for cutting PVC or PE pipe in trench or above ground. Each PLAS rotary cutter needs just 6” to 8” (153 - 203 mm) clearance around the pipe, making them easy to operate in trench and with lower prep costs. Outboard rollers keep the cutter aligned on pipe, ensuring a square cut every time. In addition, Reed has developed a hardened, tool steel blade to cut PE pipe. The curved blade drives chips out of the way, making PE cuts much easier. VIDEO DEMO OF THIS ROTARY PE PIPE CUTTER IN ACTION! Click the button below to add the PE Pipe Cutter 14" IPS - 24" IPS to your wish list.